The sleeve tattoo on Vassar senior David Carrell’s right arm tells the story of the last dozen years of his life. On his elbow, there’s a tank sprocket—for the vehicles he commanded during his four combat tours in Iraq as a staff sergeant in the army. Around it are inked the initials of the 17 soldiers from his company that were killed over there. (Carrell needs to add two more, for comrades who committed suicide after coming home.) A skull with two sabers crossed up behind it represents the cavalry unit he deployed with. And there are the combat stripes, eight in all, one for every six months he spent in Iraq. Carell is a solid man with tightly cropped blond hair and a heavy Texan drawl. When we meet in a Starbucks on Route 9 just south of Poughkeepsie, he’s just come from his post-traumatic stress disorder therapy. He has nightmares. He has flashbacks. He ruminates and processes the things he’s seen—the death and destruction and despair. “You just can’t forget it,” he says. “Before my feet hit the ground in the morning, I think about the war five times. While I’m brushing my teeth, that’s what I think of. It’s like having a movie in your head that’s always on. If you don’t keep yourself busy, it’ll eat you alive.” So he keeps busy. With the therapy, with a peer-to-peer veterans’ counseling support group. With Operation Veteran Admission—but we’ll get to that. War will mark a person. But a particularly steep toll has been paid by the 2.6 million Americans who have served in Afghanistan and Iraq, the first major American wars fought by an all-volunteer army—and the longest and third-longest in the nation’s history, respectively. These men and women took part in nasty conflicts, against insurgencies fighting with IEDs and suicide bombers. They came home with unprecedented cases of PTSD and addictions to a cocktail of psychotropic meds, reportedly misused by the armed forces to allow troubled soldiers to function in the battlefield. The shock from the explosions left them with traumatic brain injuries; the shrapnel with disfigured bodies. Some experienced sexual violence within the military. Almost all returned to a nation that said it was grateful but did little to back up its lip service. More than two million Americans came home to a wretched economy, soaring unemployment, a VA with year-long wait times for treatment and benefits, retirement payments that lagged many months behind. Veterans fell into homelessness. Gradually, suicide grew rampant among them—a VA study found that male veterans under 30 are much more likely to take their own lives than the regular population. Their homecoming was disappointing. Their bodies were broken and their minds still at war. Finding a new way to be productive is key, but for many, that was and is an elusive goal. Carrell has been busy though. When we meet, the thing that’s consuming him is the paper on Nazi propaganda that’s due later that day. At 34, Carrell, a husband, father of two teenagers, and owner of two dogs, three cats, five fish, and hamsters of a quantity he can’t remember right now, is a junior at Vassar College after 11½ years in the army. He’s a history major with a full course load. He spent 14 hours in the library yesterday, until very late, and he will be there longer when finals roll around. Luckily, the woman who runs the library lets him in early many days, before it opens at 8am. When we finish talking, he’ll go back and work on another paper. David Carrell '16 during a tour in Iraq. This isn’t how Carrell had imagined his life would go. He always figured he’d make the army his career, putting in the two decades required for a full pension. And certainly, after completing a 9-month, a 15-month, and two 12-month tours in Iraq, he’d proved his worth. There are easy deployments and there are hard ones. Some soldiers spend the entirety of their time in the theater of operations inside the various compounds, working a desk or logistical job, far from the action. Not Carrell. 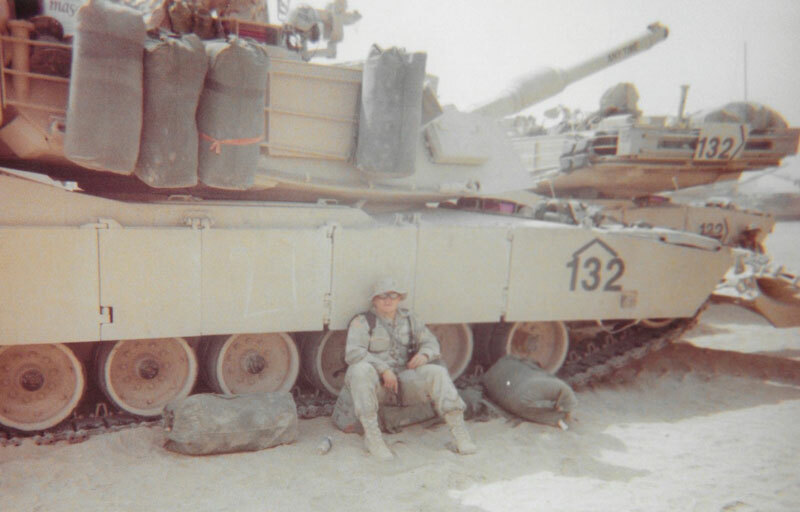 He was in Balad, Baghdad, Mosul, and Najaf, patrolling hard-fought neighborhoods, swerving the tank around the IED craters left when his peers and friends had been blown up. In some 1,100 tank missions, driving around in a big freaking target, he figures he made contact with the enemy at least 300 times. Sometimes every day for two straight months. The longest he went without getting shot at, he reckons, was 10 days. He spent four years of his life living in perpetual stress, playing Russian roulette every time the tracks rumbled out of the compound gates. He’d joined the army in the summer of 2001. His girlfriend Tori, who is now his wife, was pregnant. Carrell, a 20-year-old who had been moving furniture with his father in St. Louis, needed a job with benefits. His daughter was born on September 10, 2001. His deferred basic training was moved forward and his service began. His second child was born in April 2003, as he waited in Kuwait to invade Iraq three days later. When he came home unscathed for a fourth time in 2011, he expected life to get easier. “I’d already put in my time,” Carrell says. “All the hard work was done.” After all those tours, he could have coasted through his last years in the army training soldiers. Having spent that much time in combat, he could have risen through the ranks quickly. 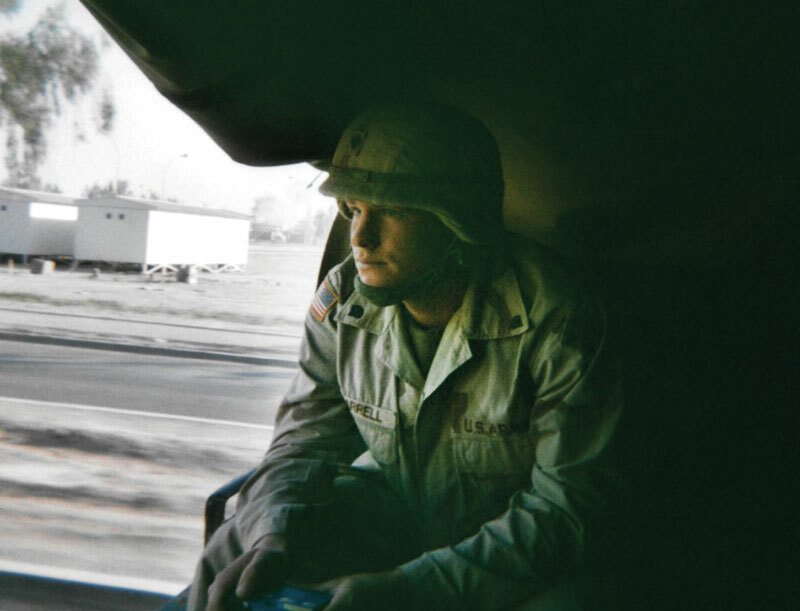 “Four tours in Iraq is like a PhD in war,” says Carrell. But when he saw an army doctor all of that fell apart. He’d gone in to get his back looked at. It had been bugging him for the longest time, but he’d always toiled through the pain—that’s the warrior mindset. He figured he’d get a prescription for some painkillers and some stretches. The doctor told him his back was shot, that he wasn’t quite sure how Carrell was still walking. Three discs had to be removed. His military career was over. But soldiers don’t just walk out of the military. Usually, they live on a base, amid colleagues who are also their friends. It’s the only life they’ve known. And while it may be over, extending it for as long as they can is more comfortable than moving on. They hang around. The realization that they have to start over, that they have to remake themselves entirely, is where the trouble begins for a lot of veterans. Without a sense of direction, many spin around aimlessly. 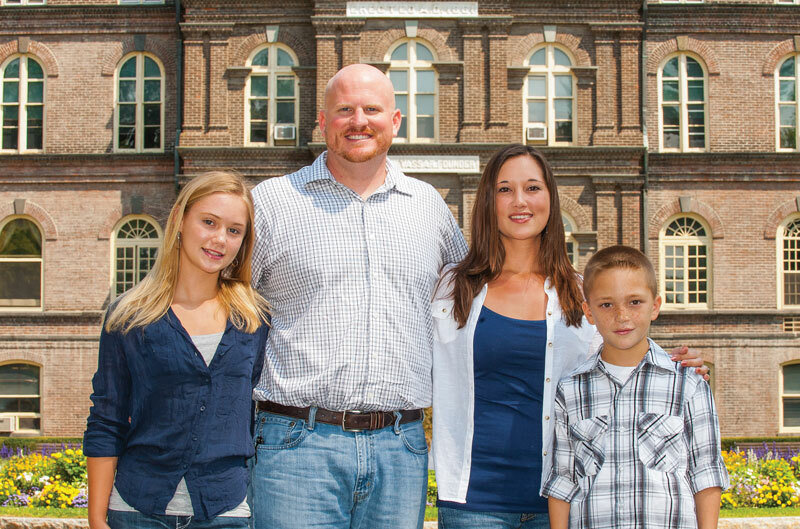 David Carrell, his wife Tori, and their children Lexus and David. He got his associate’s degree, and was asked by an advisor if he was interested in attending Vassar College, which was looking to attract veterans on a partial scholarship. Eager to break out of the army bubble, he said yes. Then he Googled Vassar. He moved his family to the Hudson Valley and shrewdly figured out the finances. Tuition was about $50,000 a year. The GI Bill would pay him up to $19,000. And the Yellow Ribbon Program would match Vassar’s scholarship of some $15,000. Put together with his housing allowance from the army and his partial pension, they could just about make ends meet. And Tori would even have time to go to Dutchess Community College, in hopes of transferring to Marist College the subsequent semester. For Carrell, college has proved an excellent remedy for quieting his inner demons. “It’s something to do and strive for,” he says. “It keeps the stress level up. And if it isn’t up, I’m bored and get complacent.” A full course load at an elite college, combined with the constant logistical challenges of their crowded household, leaves much less time to think about the war. Moving forward at breakneck pace stops him from looking back. And that, he has found, is the trick to rebuilding a life. He’s done well in college. Going back to school is supposed to be hard for veterans because they haven’t been in a classroom in years and it’s unfamiliar. “But I lived in unfamiliar territory for four years,” says Carrell. It isn’t a scary place to him. He isn’t afraid to tell his professors they’re going too fast, often to the relief of his classmates. Soon enough, Carrell realized that his friend Josh Ridley ’17, who is also a veteran at Vassar, was doing more or less the same thing. They had each helped some 15 veterans start the process of garnering the required paperwork to access all these funds—there is a prohibitive amount of red tape involved—and figured they might as well formalize their efforts into a real organization and call it Operation Veteran Admission (OVA). So they set up a website (veteranadmission.org) and got their 501(c)(3). 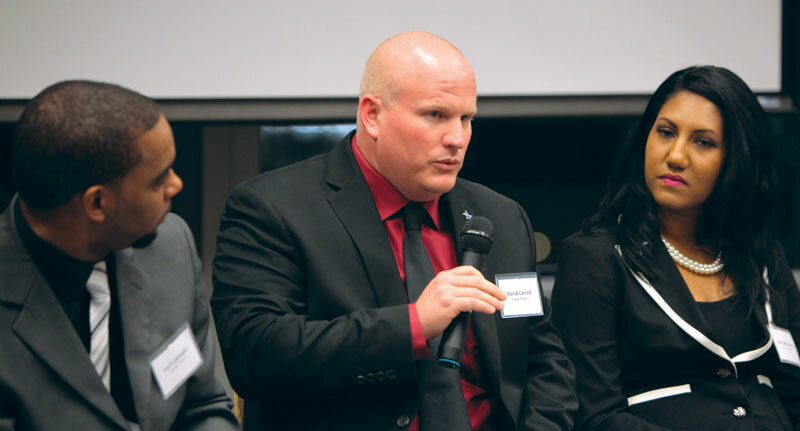 They got on the radar of various local politicians, who now steer veterans to them, and joined their veterans’ advisory commissions, made connections with local colleges—OVA only operates in the Hudson Valley at the moment. Michael Finlay will be one of the first veterans to partake in Operation Veteran Admission, which will help him navigate the winding path through claiming his benefits and securing financial aid. Finlay spent five years as a nuclear machinist mate in the navy until he was honorably discharged in 2012. He, too, had planned on making a career of his service, slogging through the brutally demanding Navy Nuclear Power School, learning how to service and operate the nuclear reactors on submarines and airplane carriers. After two years of schooling, he began his first deployment by joining up with the USS Theodore Roosevelt in the Persian Gulf. But when he finally started doing the work, he didn’t much like it. Truthfully, he’d joined the navy on something of a whim and now regretted it. He slipped into a deep depression. David Carrell at the inauguration for the first round of Posse veterans. Soon, it got so bad he had to be put on antidepressants. But sailors are not allowed to work on a nuclear reactor when they’re on antidepressants. So he was temporarily reassigned to building upkeep duty, after the ship had returned to the Norfolk shipyard. That only made things worse. And the medication made him gain weight. He failed his second and third physical standards tests—strike one came after a surgery—and the navy discharged him. OVA guided him through the labyrinthine process of recovering his lost papers. They helped him apply for his benefits, for the GI Bill, and for the various tuition grants he was eligible for. They made him aware that he was eligible for treatment for the depression he had left the military with. And then they set about making a plan. If he accomplished little else, Finlay had discovered a love for cooking in his lost time after the navy. He decided he’d like to go to the Culinary Institute of America. OVA explained what it would take to get in. That he needed six months of work experience in a professional kitchen, and that it wouldn’t hurt for Finlay to get his feet wet academically again. So he’s looking for a part-time cooking job and enrolling at Dutchess Community College. “I’m still in the beginning of the process,” Finlay says. “But if these guys hadn’t helped me I’d have no idea what I was doing. I’d still be sitting here.” Finlay hopes to eventually get his bachelor’s degree in food science from the CIA. Then he’d like to become an executive chef and perhaps open a restaurant. Getting a veteran through the process is a marathon. Carrell and Ridley have each been talking to a half dozen others, steering them in the right direction. They want to keep their organization as local and grassroots as possible. When I called Carrell a few months after we first talked to ask some follow-up questions, I caught him at a mall. He’d just spotted a man in old combat boots and asked him what he was doing for a living. He drove a truck, so Carrell told him about all the college money out there for veterans like him and handed him his business card. “We’re just trying to help people get ahead,” he says. As for Carrell himself, when he finishes up at Vassar, he’d like to get an executive MBA from the University of Texas-Austin. He’s not sure how he’ll pay for it yet. His GI Bill is due to run out. But he’ll figure out a way. And then he’ll probably start another OVA chapter down in Texas. “You kind of get to continue your service by helping veterans,” Carrell says. Public radio's Marketplace recently featued the Veterans Posse Program in a series of stories. Listen and read more about Vassar's student veterans. "Recruiting veterans to elite colleges"
"A long road from the Marines to college"